Throughout the year, UCSB’s Arts & Lectures (A&L) offers a smattering of high-quality and fun-loving events for the whole family. In years past, these daytime offerings have brought big-name, kid-friendly performers like They Might Be Giants and Ziggy Marley to the Campbell Hall stage, making for shows that are geared for the kids and enjoyed by the ’rents. This Saturday, January 21, at 11 a.m., A&L is at it again, offering up an hour-long collection of kid-geared short films from around the world from the New York International Children’s Film Festival. The aptly dubbed Kid Flix Mix offers a stunning mix of animation styles, film subjects, and techniques, all okayed for the 4-and-older crowd. Better yet, the visuals are stunning and adventurous. (Read: It’s way more engaging than that Dora the Explorer DVD your little ones have on loop.) Below, we run through just a few of the highlights of Kid Flix. For more information and tickets, call 893-3535 or visit artsandlectures.sa.ucsb.edu. 2) Snowflakes and Carrots: Samantha Leriche-Gionet’s silent offering depicts a sweet-faced little girl who scales fences—and employs some serious kiddie muscle power—to extract the carrot noses from all her neighborhood snowmen. It’s a curious task with big-time cute and cuddly rewards at the end. 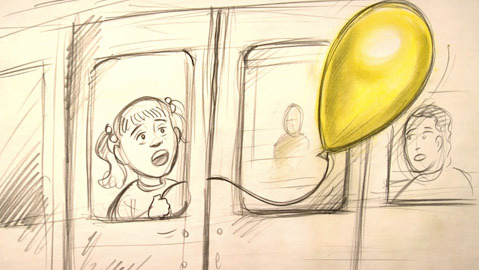 3) The Yellow Balloon: One of the few U.S. offerings of the fest, The Yellow Balloon retells a real-life story about a little girl who nearly looses her yellow balloon while riding a New York City subway. Creators Rob Castillo and Ben Thompson present the tale in a series of sketches that quite literally come alive before your eyes, and the end scene is pure childhood bliss for the adults and kids involved alike. 4) The Party: Before all this big-screen fun kicks off, the Arts & Lectures folks will host a pre-party from 10-11 a.m. Attendees are encouraged to stay in their jammies and show up early for breakfast. Open to Family Fun Series subscribers only.